Papua New Guinea U20 assistant coach Rachel Wadunah will be representing Oceania at the Asia Football Confederation (AFC) women’s instructors course in Shanghai, China in June. Wadunah said it was a great opportunity for the region but especially the development of women’s game in Papua New Guinea. “I am actually surprised. I did not expect this selection, especially when I am still working on my B-Licence. “While it is a challenge also for me in other OFC women’s football development, women’s game in PNG will be the focus, particularly on youth and rural development. In PNG men’s football is so big and established that sometimes the women’s game looks like a little add-on activity that doesn’t get much focus. That is what drives me to take up the challenges. Things have never been better, but I wake up every day knowing there is much more to be done to further develop our game. It’s a very exciting time to be in women’s football,” Wadunah says. Wadunah said she was inspired during the FIFA U-20 Women’s World Cup, where there played against the best teams in the world. One of the first female OFC B-Licence candidates for PNG, Wadunah was the assistant of the senior women during their successful XV Pacific Games campaign. She then took on the same role under Lisa Cole as Papua New Guinea made their debut at a FIFA tournament during the 2016 FIFA U-20 Women’s World Cup. 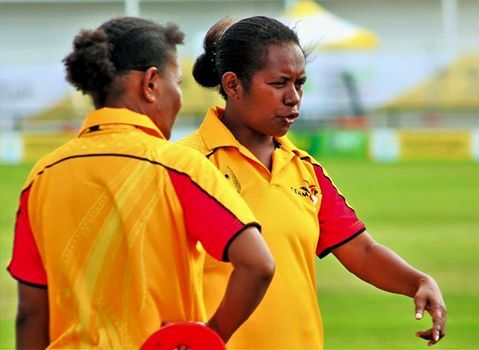 She has also played a role in the recent OFC U17 Championships by supplying ten players coming out of her Tusbab Blue Kumuls centre of excellence programme which went to represent PNG. Wadunah is currently working on a curriculum for elementary schools and said when completed she will try it out in some of the elementary schools in Madang. The course is schedule for June 20 and will ends on the 29 June 2017.